NES Spy Vs Spy (USA) in 08:47.38 by Sir VG. 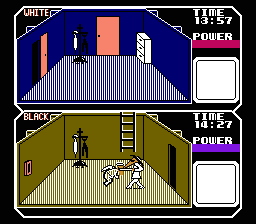 Spy vs. Spy is a game based on the famous MAD cartoon of the same name. In it, the two spies each try to collect items and then leave the embassy by plane. This gives for some interesting route planning, and at one point the author even lets his spy die so as to get the quickest time possible.